HomeHow toRoot Checker APK- How to use and Download it ? Have you ever felt confused as to whether your Android phone is rooted or not? Of course, many of us have been there especially when people like to install custom ROM’s every day but are not user if they have root access or not. To cater to this issue, one can use the Root Checker APK, which is the topic of our post today. There have been numerous misconceptions regarding root access for Android device especially the notion that rooting your Android device is the most disastrous thing one can do to their device. So before proceeding to the actual tutorial, we will discuss what rooting is essentially and what are the misconceptions regarding it that need to be cleared among the users. What is rooting and why you should do it? Rooting is a process in which you, as a user can get access to edit and modify the core files of your Android device. Almost all of Android manufacturers, with the exception of a hand full, don’t allow rooting and will void the warranty if they are able to find traces of root. That is understandable because of root access, just like anything is life, can be used for both good and bad reasons. 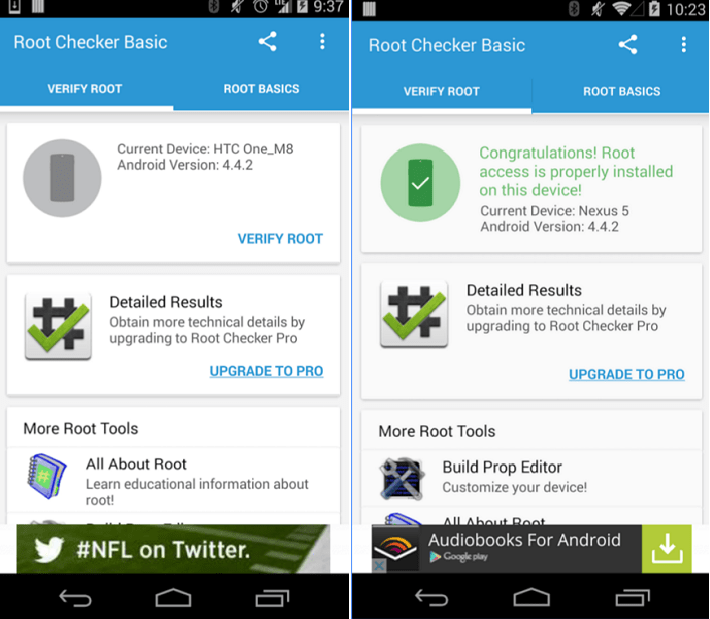 Root Checker is a simple app which allows you to see whether your Android phone has root access or not. The misconception here is that users are under the assumption that Root Checker allows you to root your Android phone in fact which isn’t true. It also lets you check the Android phone version you are using. Using the Root Checker app will let you see the resolution of your Android phone’s screen. Also Read : Play the Game Boy on Your Smart phone ! Check Root External To Internal SD Guide ! How to Find Friends on snap-chat ! How to use the Root Checker APK App? The first thing you must do is complete the downloading process of the Root Checker APK file on to your Android device or PC. If you download this APK file on your PC then you will need to transfer it your Android device. Then you must allow the installation of the app by visiting the section of Unknown Sources. This is an important step because Android by default does not allow the apps to download which is not a part of the Google Play Store. To do this you must go to the section for Settings and then find your way to the section of Security where you can see the option for ‘Unknown Sources’ and you must enable this. When you have done this you can access the File Manager and launch the Root Checker APK file on your Android phone. The installation screen will pop up. Simply hit Next and then tap the Install button for the app you wish to download on to your Android phone. The final step is to launch the app open and tap on the button which says “Verify Root”. If your Android phone has root access you will be looking at a pop-up window asking for your permission to give the root access. If this pop-up message indeed shows up, give the consent to root access and the Root Checker APK will show you the message telling you that your Android phone has been rooted. is rooted, you will see a pop-up asking you to grant Root access. If that popup shows up, grant Root access and Root checker will tell you that your phone is rooted.